In a vote of 10-5, Dallas city council members passed a proposal that requires rest breaks for construction workers Tuesday morning. The ordinance mandates a 10 minute break for every four hours worked. Neither the federal Fair Labor Standards Act nor Texas law requires employers to give their employees breaks. Breaks are considered to be an optional employee benefit, according to FLSA. The Workers Defense Project, an advocacy group that seeks better working conditions for laborers in Texas, pushed Dallas council for the rest break ordinance since 2014. 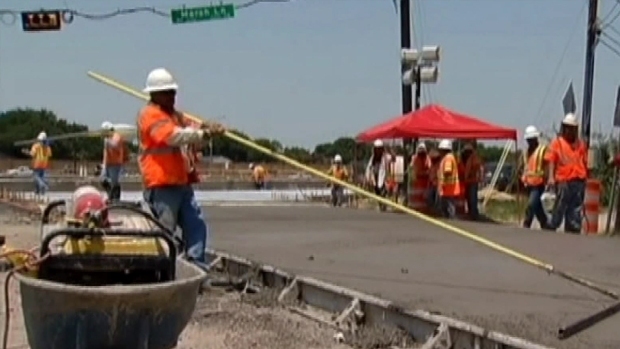 Dallas city council members will consider a proposal that would require 10 minute breaks for construction workers for every four hours worked. "They are not getting rest breaks," WSP spokeswoman Diana Ramirez said. "Some of them even laughed when I asked [if they got breaks.] They're like, 'What are you talking about? Our employers would not do that.'" That is a contention that a representative for the construction industry disputes. "We're not convinced there is a problem here," Dallas Builders Association executive officer Phil Crone said. The Dallas Builders Association is a trade association that represents about 1,100 employers in the Dallas Metropolitan area. "This ordinance that would make for criminal charges [against employers who fail to offer rest breaks] is creating a problem where solutions already exist. It is unfounded," Crone told NBCDFW. The solutions Crone suggested include a laborer reporting their employer to the Occupational Safety and Health Administration. OSHA maintains a toll-free hotline at 800-321-OSHA (6742) that can be used anonymously to "ask questions, obtain compliance assistance, file a complaint, or report amputations, eye loss, workplace hospitalizations, fatalities or situations posing imminent danger to workers," according to Juan J. Rodriguez, Deputy Regional Director of the U.S. Department of Labor's Office of Public Affairs in Dallas. According to OSHA statistics, there were four heat-related construction fatalities in Texas in Fiscal Year 2015 — Oct. 1, 2014-Sept. 30, 2015. One of those was 25-year-old Haltom City resident Roendy Granillo, who collapsed and died of heat stroke July 19, according to the Collin County Medical Examiner's Office. He was employed by a flooring contractor and had been working at a home construction site in Melissa. "Since 10 in the morning, he told his boss he was feeling sick," Granillo's father Gustavo said. "All this time he was feeling sick. You could tell he was in agony all this time." Gustavo Granillo, who also works construction, said his son and coworkers were denied access to water and rest breaks by their employer. Granillo's death and his employer, based out of an apartment in north Dallas, are currently the subject of an open OSHA investigation. OSHA has six months to complete an investigation following a fatality. Its investigation into Roendy Granillo's death began on July 28, so a finding must be made prior to Jan. 28, 2016. Dallas' rest break ordinance is similar to one already in place in Austin. According to information provided by the City of Austin, there have been 510 reports made about employers denying rest breaks since June 2014. Those reports resulted in 146 warnings to construction companies for not having proper signage posted telling workers they have the right to a ten minute break for every four hours worked. "A person who continues to violate the requirements of this ordinance after being notified of the offense in writing by an authorized City representative is subject to a civil penalty of not less than $100 or more than $500 for each day the violation occurs." Since the ordinance was approved in 2010, the City of Austin has yet to issue any citations or levy any civil penalties. "We've seen improvements," said Matthew Noriega, assistant division manager of Code Compliance in Austin. "We go out and verify the conditions when we get a report. And [the conditions] do get better." Noriega told NBCDFW the rest break ordinance has improved the quality of life for construction workers in his city. NBC 5's Ken Kalthoff and Holley Ford contributed to this report.